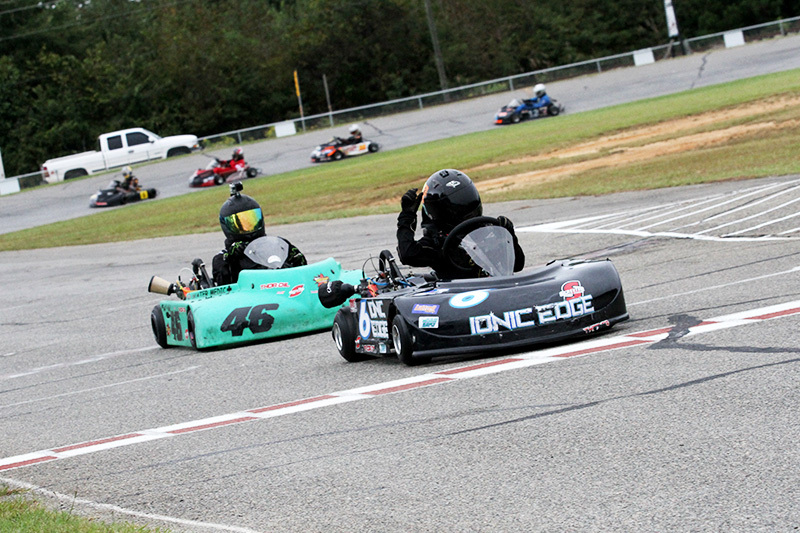 Kyle Luttrell Racing rounded out the 2015 World Karting Association Gold Cup Series with 10 drivers riding 12 different IONIC Edge Chassis in competition at the historic Lamar County Speedway in Barnesville, Ga., at the annual Gold Cup Grand Nationals. A competitive event that saw many of the best 4-cycle sprint racers in the country do battle at the tight quarter-mile sprint track resulted in the best national event ever for IONIC Edge racers. Completing a terrific season for IONIC racers, Luttrell Racing, the newest chassis manufacturer on the market, will pay back more than any other manufacturer that participated in the 2015 WKA Gold Cup Contingency Program! The Georgia-based up-and-coming builder will pay over $4,000 back to their customers through the special program! This includes multiple drivers who finished top-three in their class’s point standings, and competitors who netted wins and second-place finishes throughout the season. In addition to awarding its customers, each Gold Cup class champion will receive a $500.00 gift certificate toward a new IONIC Edge chassis, regardless of which chassis they rode. Junior Sportsman racer Aiden Baker Crouse, who was competing on an IONIC Edge for the first time, and Junior pilot Alex Vrabel combined for four feature wins for Luttrell Racing on the weekend, including Crouse’s win in the 10-lap Sportsman Pro Gas Shootout. Crouse, who unofficially wrapped up three class national championships in his first full year competing in karts, actually won four races on the weekend. His three wins in the Sportsman Pro Gas Animal divisions came on the IONIC Edge, while he also won Sunday’s LO206 Sportsman content on a different chassis make. One of the most impressive drives of the weekend came in the Sportsman Pro Gas Heavy final on Saturday, which saw Aiden race to a dominating 11-second win over his closest competitor. Aiden’s father, Jason Crouse, spoke about his team’s first event on the Luttrell Racing chassis. Macon Moore, Elijah Skaggs and Mark Steube also ran IONIC chassis in the Sportsman classes. All three drivers netted a best finish of fourth on the weekend. Moore would finish fourth in Sunday’s Sportsman Pro Gas Heavy 2 main. Skaggs ran fourth in Sunday’s Sportsman LO206 feature, rebounding nicely from an eighth-place result in the class on Saturday. And Steube narrowly missed the top-five in several finals, but did accomplish a strong fourth-place result in Saturday’s Sportsman Pro Gas Heavy feature. In the 12- to 15-year-old Junior ranks, Alex Vrabel and Brian VanCleve Jr. rode IONIC karts in classes that featured around a dozen talented young racers. Vrabel was likely seeing “4” after three consecutive fourth-place finishes. He finished fourth in both Junior Pro Gas Lite mains and fourth in Saturday’s Junior Pro Gas Heavy feature. But Vrabel wouldn’t be denied in the last race of the weekend. He’d ride his IONIC to the big win – his second of the Gold Cup season – in Junior Pro Gas 2, finishing 0.2 seconds ahead of his closest competitor. Vrabel was a threat all season in national competition and his four top-five finishes in four starts at Barnesville marked his best weekend of the year. VanCleve ran three Junior Pro Gas classes, netting a best finish of eighth in Junior Pro Gas Heavy on Saturday. While VanCleve had an off weekend at Barnesville, he did net six top-five finishes in 2015 Gold Cup Junior Pro Gas competition, including two runner-up finishes, one at Jacksonville and another at Camden, Ohio, in July. In the Senior ranks, Ohio’s Eric Fagan pocketed a pair of third-place finishes in Senior Pro Gas, while Dustin Demattia – another Buckeye State racer – never finished outside the top five between the two Senior Pro Gas and two LO206 Heavy main events. Fagan and Demattia also finished second and third in the Senior Pro Gas Money Race. Fagan actually crossed the finish stripe first in Saturday’s 21-kart LO206 Heavy final, but would be disqualified for running the wrong spark plug. He set the fast lap in the race and won the class’s heat race, but the feature win wasn’t in the cards on this day after dominating most of the day’s program. Fagan was strong in Senior Pro Gas, as well. As noted, he’d net two third-place results between Saturday and Sunday’s main events. He also won the Pole Awards both days, turning a fast lap of 24.859 in Saturday’s qualifying round. Demattia continued to prove he’s one of the most consistent racers in Gold Cup. Completing his second full season on the IONIC Edge, Demattia finished fourth and fifth in the two Pro Gas mains, but more impressively, raced to a second and third-place result in the LO206 Heavy finals. Tennessee’s Joseph Skaggs was impressive all weekend on his IONIC Edge. Skaggs challenged for wins in both LO206 contents, which each started over 20 karts. Skaggs would settle for finishes of third on Saturday – right behind Demattia – and a strong second-place result in Sunday’s 20-lap LO206 main. Matt Skaggs also competed in the LO206 Heavy division on Saturday. While he ran into bad luck in the heat and feature, Skaggs qualified eighth of 21 starters. Skaggs won the LO206 Heavy national championship last year, which marked IONIC Edge’s first national title.